WHEELS / TIRES / RIMS. Wheels / Rims / Tires / Sets. Bodies / Lights / Accessories. Electric Motors / Speed Controls. Accessories Glow Plugs, Temp Guns, etc..
Nitro Engine Parts Tune Pipes, gaskets, etc.. Adhesives / Fluids / Tools. Buildings / Bridges / Tunnels. Grasses / Trees / Scenery. Trains / Tracks / Sets. Accessories / Tape / Brushes. Paint - Aerosol / Spray Cans. Paint - Airbrush / Bottles. Futaba 6J 6-Channel 2.4GHz S-FHSS Radio System w/ R2006GS Receiver FUTK6000. Brand New In Factory Packaging. In-Stock, Ships Within 24 Hrs. FEATURES: Selectable S-FHSS and FHSS modes, the included R2006GS receiver. Automatically adapts to the selected mode. Capable of 4 channels only in FHSS mode. Fail safe on all channels in S-FHSS mode only throttle channel only. When FHSS mode is selected. 15 model memory with 4 character model naming. 40x40 127 segment LCD display. Modes 1-4 selectable by pilot. R2006GS high-voltage (4.8 - 7.4V) 6-channel receiver with Easy-Link. Circuitry, frequency hopping, spread spectrum design and Dual. Endpoint adjustment (EPA), sub trims, servo reversing & throttle cut. Throttle position, mix and low battery warnings. Trainer system (trainer cord not included). Two programmable mixes and two 5-point throttle curves. Four swash plate types (H1, H3, HR3 & H3 w/AFR). 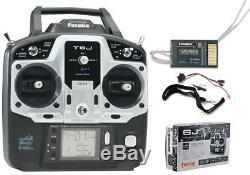 INCLUDES: Futaba 6J 6-Channel Transmitter, R2006GS Receiver, Instruction. Manual, Neckstrap and Smooth Ratchet Plate for Heli Throttle. There is an optional NiMH battery which can be used. Battery door and charge lead from Futaba Services, see comments. REQUIRES: AA Cells: Four for transmitter. Servos of modeler's choice. Type: 2-stick, 6-channel, FHSS/S-FHSS selectable. Modes: FHSS or S-FHSS (auto selectable). Power Requirements: 4.8V-7.4V. Compatible Batteries: NiCd, NiMH, LiPo, LiIon & LiFe. Dimensions: 1-11/16 x 15/16 x 5/16 (43 x 24 x 7.9mm). Weight: 0.29oz (8.3g). We are an authorized dealer of every product we offer in our store. There are always ways to work things out to meet your satisfaction. Top 10 Reasons to Shop At GoNitroHobbies. We are authorized dealers of all the items we sell and all products are brand new in factory packaging. We have been serving R/C hobby enthusiasts worldwide for over 9 years. We aim to offer all of our customers with the best service to ensure their satisfaction is met. With thousands of satisfied customers around the world, check out our feedback and you'll see why customers prefer to shop with us. We offer a wide selection of products and carry a ton of brands to ensure our customers find what they're looking for. We insure that all orders are packed properly and delivered to your doorstop safely. The item "Futaba 6J 6-Channel 2.4GHz S-FHSS Radio System with R2006GS Receiver FUTK6000" is in sale since Friday, September 21, 2018. This item is in the category "Toys & Hobbies\Radio Control & Control Line\RC Model Vehicle Parts & Accs\Control, Radio & Electronics\Receivers & Transmitters". The seller is "gonitrohobbies" and is located in Ramsey, New Jersey. This item can be shipped to United States, Canada, United Kingdom, China, Mexico, Germany, Japan, Brazil, France, Australia, Denmark, Romania, Slovakia, Bulgaria, Czech republic, Finland, Hungary, Latvia, Lithuania, Malta, Estonia, Greece, Portugal, Cyprus, Slovenia, Sweden, South Korea, Indonesia, Taiwan, South africa, Thailand, Belgium, Hong Kong, Ireland, Netherlands, Poland, Spain, Italy, Austria, Bahamas, Israel, New Zealand, Philippines, Singapore, Switzerland, Norway, Saudi arabia, Ukraine, United arab emirates, Qatar, Kuwait, Bahrain, Croatia, Malaysia, Chile, Colombia, Costa rica, Dominican republic, Panama, Trinidad and tobago, Guatemala, El salvador, Honduras, Jamaica, Antigua and barbuda, Aruba, Belize, Dominica, Grenada, Saint kitts and nevis, Saint lucia, Montserrat, Turks and caicos islands, Barbados, Bangladesh, Bermuda, Brunei darussalam, Bolivia, Ecuador, Egypt, French guiana, Guernsey, Gibraltar, Guadeloupe, Iceland, Jersey, Jordan, Cambodia, Cayman islands, Liechtenstein, Sri lanka, Luxembourg, Monaco, Macao, Martinique, Maldives, Nicaragua, Oman, Peru, Pakistan, Paraguay, Reunion, Uruguay.